I think the first time I heard how amazing Fernandez & Wells was, was though was Krista’s glowing review from a couple years ago. Since then, everything I’ve ever heard has just been endlessly positive. So when I found myself in Soho and starving, I figured it was the perfect opportunity to give this ‘wonder-sandwich’ a go. It’s not a huge place. There are a few stools along the side across from a counter filled with lots of delicious ingredients. There’s a larger area of seating in the back, but it’s full. I look to the menu and see the chorizo and pepper sandwich I’d heard so much about, and order. Wow. Chorizo everywhere! I wish I had more to say about it though. 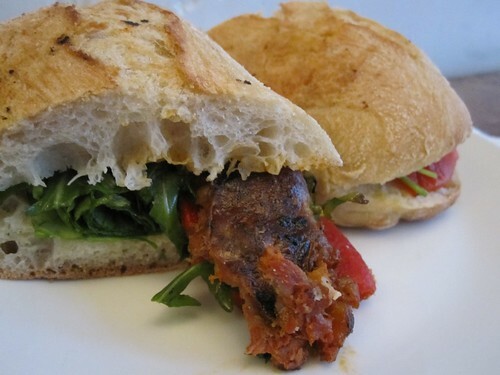 Everything was nice – the bread was fresh, the chorizo and pepper obviously high quality – but it wasn’t the most fantastic sandwich I’ve ever had in my life. Maybe I just got my hopes up too much. Fernandez & Wells is a great place, and I would go here again, but I’m not sure it lives up to the hype. Or maybe I just need to try something with a little more oomph.